There is some confusion over the dates and the marking of William Welch - raising questions on whether a given item was made by William Welch of Plymouth Dock, or William Welch of Exeter. It appears that both persons used the same two letters, WW, for their mark, (sometimes with a pellet between the two letters, sometimes not) and that both persons registered their silverware for assay at Exeter. Jackson’s* reference book details William Welch of Plymouth Dock registering silverware from 1758 to 1809, and a William Welch of Exeter registering items between 1801 to 182?. Graham Hodges of www.SilverSugarTongs has studied the Welch name on Exeter registered silverware and in June 2009 searched original source material, the actual assay books at Exeter. He found* the last entry for William Welch of Plymouth Dock was 14 February 1800, and the first date for William Welch of Exeter was 20th March 1801. Since original records were searched by Graham his dates are preferred to Jackson's. From that we could say therefore, items hallmarked WW at Exeter prior to March 1801 were certainly made by William Welch of Plymouth Dock - whether or not there was a pellet in between the WW letters - and those hallmarked WW at Exeter after 1801 were not. Graham concludes his article with the interpretation that there were possibly three silversmiths by the name of Welch in Plymouth Dock, perhaps William senior and William junior, with the third one possibly a relative called Thomas Welch. I would agree. In the Plymouth Dock section of the 1791 Universal Directory of Great Britain there is a Welch - silversmith, and a Welch William - button maker. There is no mention whether these are father and son but it's possible that the button-maker Welch was the apprentice son of the silversmith Welch. * Personal correspondence between Liz Cook and Graham Hodges. * Thank you to the various Ebay sellers for giving permission to use their photos, it's appreciated. Whilst I have recorded facts such as the date of sale, the price achieved &c. the 'description' of each item below was that description as provided by the seller at the time - these are not descriptions as provided by Devonport Online. Size: They are 5 3/8" long and 5/8" wide at the bow. Condition: Very good condition with just the usual light surface scratching and no dents or dinks or repairs and little distortion. Rare Old-English Pattern. This is a lovely pair of Georgian solid sterling silver sugar tongs (or sugar nips as I believe they are called in the USA) that were made in Plymouth Dock, England 1790, by the illustrious Georgian silversmith, William Welch. They are engraved to the bow with H over GM. I have shown the hallmarks so that you can make up your own mind. A really rare set from an illustrious provincial silversmith in superb condition after about 220 years! 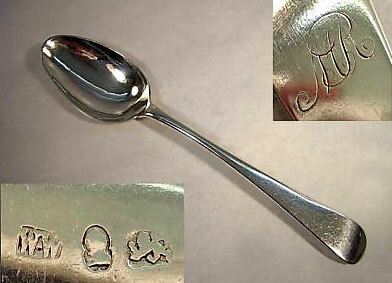 Georgian silver spoon, dessert size, Old-English pattern with engraved terminal. William Welch, scarce provincial maker registered in Plymouth Dock. Superb collectors piece. Date c1795. Assay City - Exeter. Sterling Silver .925 fineness. Scarce Georgian silver sugar tongs. Bright-cut detail with flared legs and engraved shoulder. Maker William Welch registered in Plymouth Dock until the early 1800. Superb collectors piece. Date c1795. Good provincial silver. 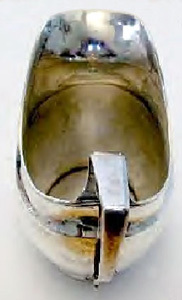 Size: Measures 3 ½” high and 4 ½” from spout to back of the handle. Condition: Apart from a slight repair where the bottom of the handle meets the body, this 200 year old jug is in good condition and has been tested for leaks(none). 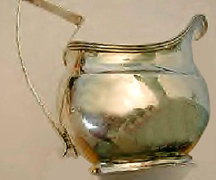 A George III Exeter sterling silver oval classic cream jug in its original condition. This cream jug was made by William Welch, one of the main family of silversmiths of the period from 1758 till 1828 and working from Plymouth Dock. The mark is slightly worn due to the constant cleaning of the plain surface and the two hallmarks shown are consistent with Exeter cream jugs of this period. No other marks tended to be used on smaller items at this period, this was to prevent the mark being transposed into a larger article and not pay the duty on silver. It was probably made in the late 1790’s when the duty on silver was doubled. The style is one of the most beautiful of classic Georgian with its plain oval style with reed border around the top edge of the cream jug and the simple handle. This is a fine item that would be a useful and decorative everyday cream jug.